How can we be more effective in our mission through theological education in the Church of the Nazarene? 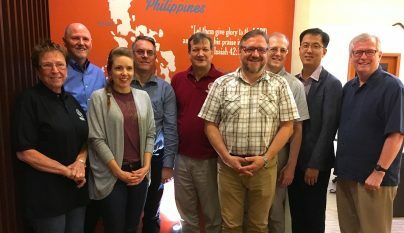 A group of educators and leaders from Asia-Pacific, the USA, and Europe met in the Philippines July 24-27 to explore this question. This was the continuation of a dialogue started in Singapore in October 2017. Changes are happening in education across the globe and the Church of the Nazarene must be prepared. This group strategized how to be ready for these changes. The church is growing rapidly in some areas of the Asia-Pacific Region, leaving a high demand for equipped leaders. In other places, the growth has stagnated, leaving the need for a fresh vision and new methods. Our Nazarene theology of holiness as love provides a clear roadmap to effective disciple-making. Disciple making is not for a select few but is at the very heart of who we are as Jesus’ followers. This is not a matter of knowing but of doing: living out the message that we believe. The goal of theological education is to train catalytic leaders who in turn train others to fulfill the Great Commission of making Christlike disciples who are also equipped to carry on this mission by making more disciples. How will we reach that goal? The old way of thinking is often called the “parish model”: most of the work of ministry is left to a few highly trained professional clergy. The Asia-Pacific Region urges a paradigm change where all believers are trained for the mission. This will require cooperation between the local church, districts, and educational providers. Education must be applicable to local contexts, accessible in local languages, affordable for everyone, and with opportunity for continued growth. In order to fulfill our mission, the Asia-Pacific Region is rolling out a new course of study for ministry that is being widely adopted. This new curriculum focuses on character formation in context through mentoring and the development of practical skills. It is important that students learn together through fellowship with God, dialogue with one another, involvement in local churches, and engagement in their local community. We affirm that our purpose is to make Christlike disciples who multiply. We affirm the role and the equipping of the priesthood of all believers. We affirm that theological education is about developing Christlike character in the community. We affirm that theological education begins in the local church with intentional discipleship. We affirm that the theological education process must be relational. We affirm that the educational process is a shared responsibility between educators, church, mentors, and District Ministerial Studies Boards and District Ministerial Credential Boards. We affirm the catalytic role of faculty in the development of students. We affirm the need for the transformational development of college boards, administration, and faculty members to develop the character of students. We affirm the importance of Wesleyan-Holiness theological tradition and accountability. We affirm that we are stronger when we collaborate.